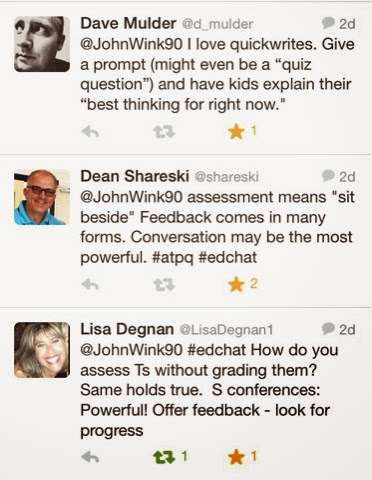 I ran into a little push-back about assessment. The chief complaint was that increasing the number of assessments requires teachers to give up more instructional time to test kids. I couldn't agree more with. We don't need more tests. We need more instruction. But here's the deal. 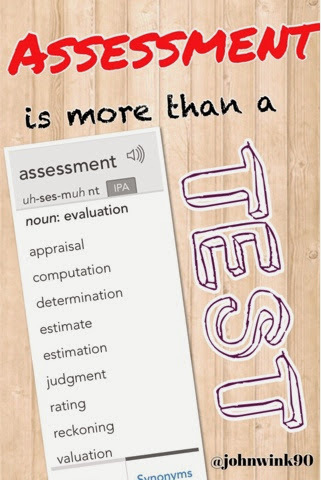 Assessment is not testing. Assessment is determining if learning is actually taking place. In fact, assessment is a vital component on excellent instruction, and without assessment, you're not delivering instruction. You're disseminating information and opportunities to learn. So here are 5 ways to assess without testing. Listening - If you listen to kids, and they can't talk about their learning or content, they aren't learning the content. Observation - Watching kids interact with content tells you what misconceptions they have with content. Conversation - A conversation with a kid about his understanding of the content will tell you so much more than any test ever could. Portfolio - Collecting samples of authentic student work over time gives teachers the full picture of a child's learning from initial instruction to the end of the unit. Here are some bonus ideas from my PLN. I posed the following question, "How do you assess without testing or grading?" I really enjoyed their perspectives, and hope you do as well. Drop a comment. How do you assess without giving a test? Nice post John. All that you and your co-learners share make sense. I have my students doing this daily (work in groups, explain to each other and to me), but how do you translate this into a grade in the gradebook? this is my current struggle right now. I have so many opportunities daily to assess what they know, but I haven't figured out how to turn it into a tangible grade. Suggestions? I have posed the same question to my colleagues and administrators repeatedly. The answer is always the same. Rubrics. But there are rubrics and then there are rubrics. Creating or finding rubrics you can work with is the challenge. Rubrics that use words such as "appropriate" don't help me. My colleagues have their own internal rubrics but don't even seem to realize they are grading using instinct. It is the subjective nature of grading that makes me so uncomfortable. Great post! Teacher judgement has to be considered as a huge portion of assessment. One of the ways I assess the true ability of my students, (especially the over achiever who is keen on being the first one done with everything) is to have them explain how to do something to another student and observing his or her instructional technique. It helps the less inclined student to not feel like he has all the teachers attention (again) and it helps seat the information for the student doing the tutoring. Often, while helping others the advanced student sees gaps in his/her own information and willingly brings them to my attention. All good points. I have done the same and am surprised by the criticism from colleagues who see it as unfair to ask this of the more advanced students. In fact, the more advanced students are flattered and eager to take on a teaching role. Great post! Spot on that we need to be clear about the difference between assessment and testing, and that "without assessment, you're not delivering instruction. You're disseminating information and opportunities to learn." Great point about assessment versus testing. Educators must take advantage of the opportunities that are readily available to ensure student learning outcomes. All great suggestions, and some important questions being raised. The answer lies in the criteria. The question about grading, and the comment "There are rubrics..etc" highlight that we educators always have criteria in our minds, whether we articulate them or not. We need to be clear on what successful learning looks like, first with ourselves, and then most importantly with our students. And, we need quality criteria. 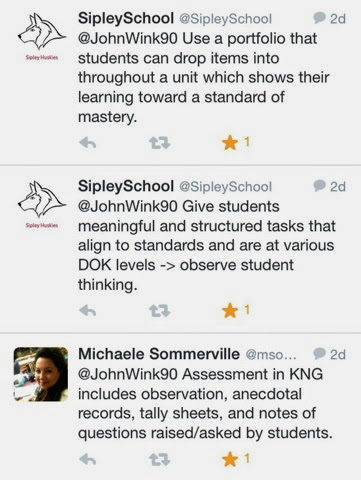 If the standard requires students to "analyze", for example, we need to define what it looks like to analyze well. The criteria we identify and share with our students determines what our students will learn, and helps us to assess with validity and reliability.